Red Cherry Shrimp. That is the question! Are they easy to care for? That depends on what you call easy. Changing the water is the hardest part of maintenance. Ammonia poisoning is one of the most common causes of aquatic deaths in household pets. Shrimp need fresh water frequently especially with a small tank. More water means more stable water chemistry and temperature which is good for the shrimp. It is also a good idea to have a canopy, filter and heater on the tank and look up how to “fishless cycle an aquarium”. Shrimp need a very specific environment, but once you know the basics the biggest problem will be what to do with all of them. 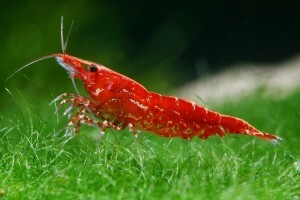 Cherry shrimp breed like well… shrimp. Very quickly. You will need to deal with the offspring over time. They multiply rapidly under good conditions. Are they expensive to care for? They are not greatly expensive. 6 dollars a piece in 2014 is not unusual. That expense, plus the tank, sand plants heater, light and canopy as well as a quality filter will be in the startup costs. They need algae and plants for diet. Hikari algae wafers and hikari crab as well as blanched veggies are what some people feed them (Consult the fish store for more details). Some say dark sand is better as it helps them keep a rich color. Cherry reds are a Neocaridina species that prefer warm tropical water. Looking to the future, a larger tank and other fish corydoras, tetras, barbs, livebearers, small fishes that aren’t real aggressive can be added to the tank. You might want to weigh ghost shrimp in on the equation if you are looking for a beginner pet. Ghost shrimp are hardier. They can tolerate a larger range of water parameters and temperatures, but they are also harder to breed because their eggs hatch into larvae, where cherry are more expensive, but easier to breed because they hatch a more robust offspring. Watch who you let them keep company with, They aren’t entirely compatible with other shrimps or fish either because they will eat or be eaten depending on who is roving the neighborhood. Cherry shrimp are generally considered a “beginner” shrimp, but they are more prone to environmental disturbances than ghost shrimp. They do tolerate some variety, but do best at tightly maintained tropical temperature ranges with clean fresh water. Of the important things, a filter with a sponge covering the intake is a high priority for cherry shrimp in addition to fine sand for them to dig around in. You can get away with less frequent water changes with a larger tank and a good filter. Some food every other day or once a day is all they need on an ongoing basis. A fair rule of thumb is 10 shrimp per gallon, so you could have about 100 shrimp in a 10 gallon tank. The bottom line is their pretty easy as pets go and a great beginner pet for a child learning responsibility or an adult wanting to enjoy the joys of having aquatic creatures. It might be a good idea to start bigger on the tank and smaller on the number of creatures in it to get your “feet wet”, so to speak.